India, by common consent, the world'sDemocracy has been condusting perodic Elections from 1952 and the General Elections of 2014 was momentous in that for the first time in 30 years a single National party emerged with a clear majority, albeit a majority of just 10 seats. Elections in India are extrmely complexin terms social, political and legal issues and can be a logistical nightmare in some instances. The use of the Electronic Voting Machine has revolutionized India elections and India can proudly claim that it conducts the fairest and the freest elections in the world. There are serious doubts over the democratic credentials of USA especially when it comes to voting rights for non white citizens. I do not think there is a comprehensive Atlas for US elections and the Book under review is a valuable resource for anyone interested in Election Studies. The organization of Big Data mined form a host of Election Commission Reports and the like is a huge challenge and the Editors have done a great job assembing the complex data in tabular form with accompanying maps. 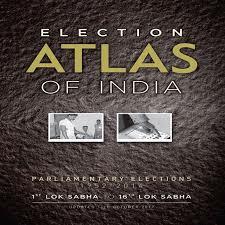 An iteresting feaure of the Atlas is the use of GIS for generating maps of Indian parliamentary elections.I am sure that political parties like the BJP will find a wealth of information in this Atlas and if integrated with the Census Data and the National Sample Survey data, a political party can generate both the socia-economic profile of the Constitueny as well as its electoral history. Basic political data like total number of electorate and its division, the number of candidates in the constituency, the votes polled, the margin of vicctory, the number of polling station are all visually represnted in the Atlas. Interestingly, the distibution of political parties that came second in each parliamentary constituency across 16 General Elections is also given.Statistically significant data such as the margin of victory as conforming to or deviating from the national median is also given. Section II, entitled Election Timeline and General Info gives us a clear picture of certain sighnificant aspects of each parliamentary poll: the constituencies with the highest and the lowest turnout, the victory margin, the pecentage of votes that resulted in victory etc. This book is a fantastic excersise in Big Data Anaysis and presnetation. I wish politics departments of Indian Universites teach their students how to use this wealth of information in their anaysis. One fact that emerges clearly, contrary to popular perception is that the BJP out performs all other National political parties in temrs of winning SC reserved seats and ST reserved seats.